In late 2016, investigative journalist Abby Martin had the opportunity to interview 16-year-old Ahed Tamimi. The two discussed the hardships of living under Israeli occupation as well as Tamimi’s future aspirations. It quickly becomes apparent why her oppressors are attempting to silence the teen and her family. 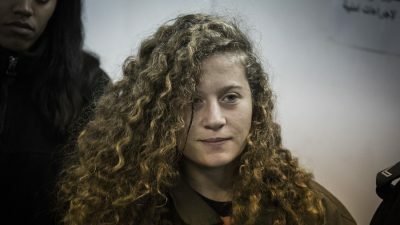 The struggle for Palestinian human rights and children abused under Israeli occupation has burst into the international spotlight with the help of 16-year-old Ahed Tamimi. Tamimi is no stranger to the Palestinian struggle or the spotlight — she has faced off with her oppressor far too many times in her short life. Palestinian teenager Ahed Tamimi has come to age under Israeli occupation, bestowing a unique and distressing childhood experience. Her family participates in weekly protests in Nabi Saleh — the small village, threatened by illegal settlements, in which they live. Tamimi’s family has repeatedly found itself the target of Israel’s violence as a result of its commitment to resisting occupation forces. Tamimi, along with her family, has not bowed to the pressure, run from the persecution, or faltered, even after relatives have been injured and killed. Instead, they continue to stand up in the face of their oppressors, with Tamimi herself fighting back both verbally and physically on multiple occasions — such as when she fought off soldiers attempting to arrest her brother or when she was caught on video telling off a soldier who hurled a concussion grenade near her. In late 2016, while in the West Bank, investigative journalist Abby Martin had the opportunity to interview Tamimi for the Empire Files, a documentary series airing on Telesur. The two discussed the hardships of living under Israeli occupation as well as Tamimi’s future aspirations. It quickly becomes apparent why her oppressors are attempting to silence the teen and her family. Moment’s before Tamimi was shown on tape attempting to physically force Israeli forces off her family’s land, her cousin Mohammad was shot in the head, point blank. Despite internal bleeding, Mohammad miraculously survived the ordeal. A few days later, Israeli forces returned for Tamimi. In the middle of the night, the teen was violently arrested by armed forces. Along with Tamimi, her mother, aunt, and 20-year-old cousin have also been arrested. Tamimi’s mother was charged with incitement for simply uploading the video of her daughter to social media. Following Tamimi’s recent arrest, her father took to Facebook, where he shared details of his family’s phones, cameras and laptops being stolen during a raid by Israeli forces in response to the incident. It was not his first time detailing such an experience. Tamimi’s father is a principal organizer of the weekly protests in their village. Years prior, in 2011, Tamimi’s uncle Mostafa was killed after being hit by a tear-gas canister fired at close range. One year later her uncle Roshdy was shot and killed. Most recently, Musaab, a young relative of Tamimi, was killed by Israeli forces when he was shot at close range. His death marked the first murder of a Palestinian by Israel in 2018. “The occupation army has been raiding both Deir Nitham and Nabi Saleh day in and day out. They come in, irritate the residents, raid our homes at night and throw sound bombs in the street. This has been our reality every day. In 2016 Martin visited the family’s village, Nabi Saleh, the site of weekly non-violent marches against illegal settlements that are stealing lands belonging to Palestinian families and farmers. The area is littered with evidence of the constant conflict, with used munitions scattered about. The village is small, with fewer than 200 residents, and is under constant surveillance. It is surrounded by permanent Israeli bases and dangerous checkpoints. Occupation forces rule over the area, frequently closing streets and entering homes whenever they deem necessary. In multiple directions, new and constantly expanding Israeli settlements, filled with armed and dangerous Israeli militia, dot the landscape. As Tamimi sits in jail awaiting trial following her recent arrest, the teen’s image is being plastered across both mainstream and independent media outlets. Tamimi’s supporters have gathered in protest to show their support and others have taken to social media to amplify her message. To many, Tamimi is a shining example when it comes to the Palestinian resistance, but to others, she is the enemy. As of January 4, 14 Palestinians have been killed by occupation forces since U.S. President Donald Trump officially recognized Jerusalem as the capital of Israel in December. 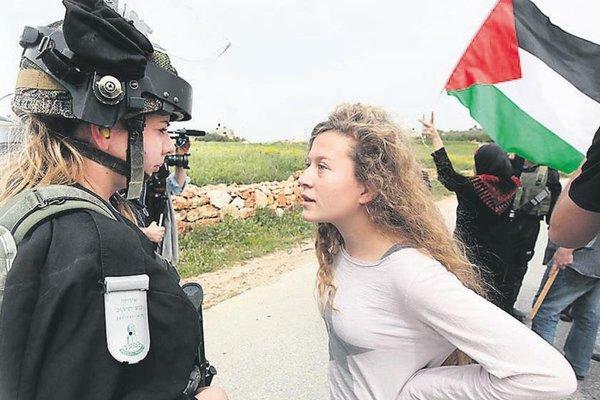 It is no wonder Tamimi is so outspoken, passionate and fearless. Featured image is from RT.